The 1890’s sailing environment was the pinnacle of conservatism. Then along came this upstart called Mark Foy. He had made his fortune in retailing and had one of the biggest department stores in Sydney. 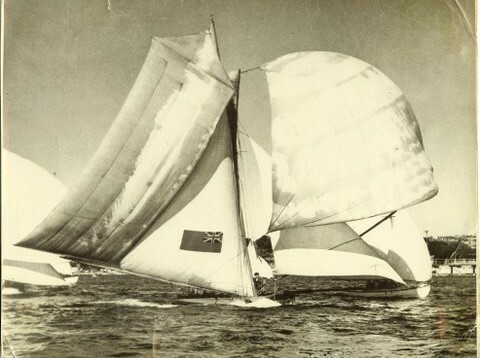 He wanted to upend tradition and do things like have colours on sails so spectators could easily identify boats. “If that’s the way it is going to be, I will go off and start my own competition,” said Mark. The gentlemen of the sailing establishment leaned back, took a puff on their cigars and downed another port. Mark Foy was not a man to let a little thing like total opposition from the sailing establishment stand in his way. He started Sydney Flying Squadron. At first they raced all lengths of open boat from 6 footers up to 24 footers. Gradually the 18-footers came to dominate. Instead of complex rules and formulas the standing joke was there were only two rules. The boats had to be 18 feet long, and the race started at a quarter to three. “there is not the slightest doubt but that it should prove a success ……exciting finishes are the result”. By the 1920s several over-full ferries would follow the boats around the harbour. 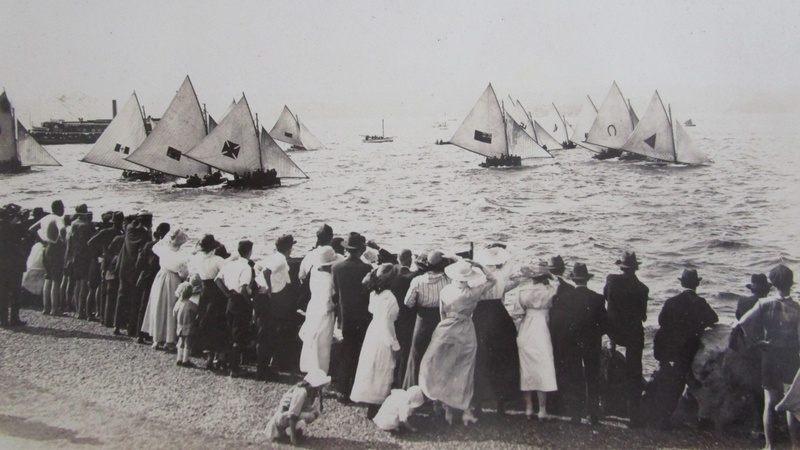 Thousands would line the harbour to watch the races. The skippers were the rock stars of sport in Sydney. But there was another reason for the popularity. 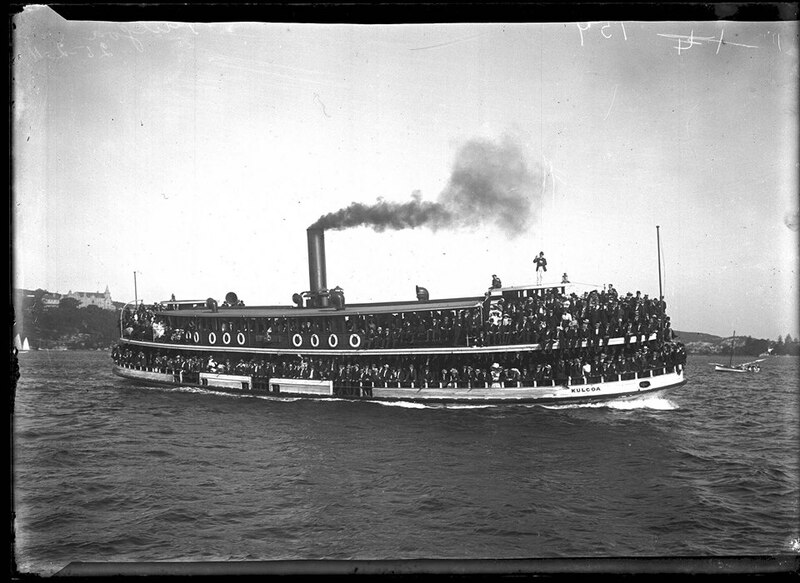 Aboard the ferries, illegal bookies would take bets on the races. Who finished first. Who would capsize. Who would be first around the next mark. Of course those good citizens who thought gambling was the work of the devil, were horrified and demanded the police do something. Occasionally the police boarded a ferry and found not a trace of gambling. Many of these raids took some time to actually take place. Ferries are tricky things to board, particularly when they are weaving down the harbour. Nevertheless, when the police finally got on board there was not a sign any gambling was going on. The typical 18-footer of the early twentieth century carried a crew of 12 to 15. Yes, that is 15 people in 18 feet. You had to carry so many people as moving ballast to balance the enormous rigs. Every conceivable type of sail was deployed – and a few that were inconceivable. Water sails hung under the bow sprit (called a bumkin on 18-footers). Ringtails that hoist outside the mainsail when running downwind. Width narrowed from 8 foot beam down to 6 foot. The boats we race today from Sydney Flying Squadron are replicas of those boats. We have made some changes. All boats use modern sail material rather than cotton sails. Masts are generally aluminium rather than timber. Hulls are moulded plywood rather than planked. We do have one boat – Britannia – that uses timber spars and a carvel planked hull. The boats still provide the same thrill they did in 1920 and require a set of skills most modern sailors would never learn. The fleet and our sailors keep alive knowledge and tradition that would otherwise disappear. The club also has an ongoing history function and has collected trophies, documents, and memorabilia of that time. We continue to collect material and ensure that the experiences and achievements of those intrepid sailors will never be forgotten.